IT ALL came too easily for Ben Ainsworth. The future Gold Coast Sun and No.4 pick in last year's NAB AFL Draft was an All Australian at the 2015 AFL Under-18 Championships about 18 months before he was eligible to be drafted. Gippsland Power's long-time talent manager Peter Francis – a 1979 Carlton premiership wingman – even earmarked Ainsworth as an AFL footballer watching him in an under-14 interleague all-stars match. Something had to give. Enter Ainsworth's 2016 campaign, which began with him breaking his left wrist in January while training in the United States with the AFL Academy. He recovered in time for round one of the TAC Cup season, but a knee injury set him back again. Three weeks after returning from that, the gun teenager was reported for a high hit that left Calder Cannon James Peters with a broken jaw. The fallout from all of that was brutal – not the least of which was a four-week ban – and he heard some hard truths from varied sources, including Power coach and ex-AFL swingman Leigh Brown. "My bottom-age year in 2015 was all bright, then the following year not so much, with getting injured and a few other incidents as well," Ainsworth told AFL.com.au. "It probably wasn't the most pleasing year last year, and I learned a lot about myself in terms of how I deal with adversity, so it was good and a blessing in disguise in some ways. "But I think I've come out the better end of that and learned from, I wouldn't call them mistakes, but just the challenges I've faced over the last couple of years." Those experiences have come in handy in Ainsworth's maiden AFL season with the Suns, one with a late reward – recognition as the round 22 NAB AFL Rising Star. He kicked three goals from 10 disposals in his latest encouraging display. 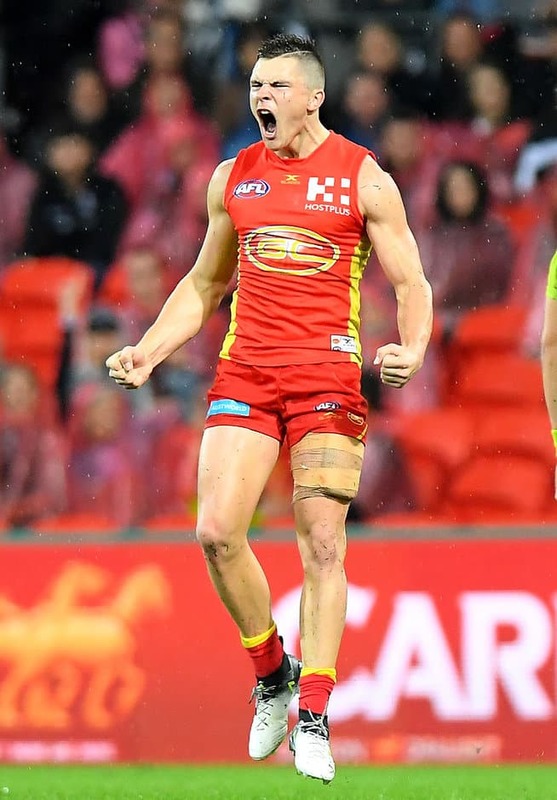 There was also an 18-possession effort against the Hawks in round 12, as well as a career-best four goals in Gold Coast's round 15 triumph over North Melbourne. But it hasn't been all smooth sailing for the 178cm forward, who most experts project to become a midfielder. A quad injury in round two spoiled a promising start to his career and he wasn't seen at AFL level again until the aforementioned Hawthorn game. Toss in coach Rodney Eade's sacking and the speculation about high-profile teammate Gary Ablett's future, and the move from sleepy Morwell to the bright lights of Gold Coast is the least of his problems. "It was obviously pretty deflating (getting injured) so early on, because you just want to go out there and prove your worth," Ainsworth said. "I just had to look at it in every positive way possible, and just get around my teammates and not dwell on it as much as I did in the past. "The players, I don't think, have been sidetracked (by the off-field issues) … there's not much we can do, as far as things that go on upstairs." Francis and Brown took turns on Monday offering rich praise for Ainsworth, a footballer they know better than any other. Francis started: "He's a really, really professional kid who's very serious about his football." Brown followed up speaking about the "competitive beast" who hates being beaten in anything from the beep test to the bench press to a contest on the Morwell Recreation Reserve. Popular and loyal were further Brown descriptions, while Francis gushed about Ainsworth's movement – "he has feather feet … he just glides across the ground". But the last word goes to Ainsworth, whose leadership qualities shone through in his call to arms to Gold Coasters. "It's a tough period at the moment, so we just need to reiterate we're on the way up, and we've got the right people at the club to head us in the right direction," Ainsworth said. "There's a bundle of talent here at the Coast – (Jack) Scrimshaw, (Will) Brodie, (Jack) Bowes and the likes of them – so hang in there and we'll be right." • How does the Rising Star Award work and who is eligible?